A hilarious jungle farce from best-selling and award-winning author Tony Bradman, creator of Dilly the Dinosaur. One day, a small, round, hairy thing fell from a tree ...and landed right in front of Elephant. "What's this?" Elephant rumbled, picking it up with his trunk. He hoped it was a tasty treat, but he was disappointed. "A coconut? I hate coconuts!" A case of mistaken identity is sweeping the jungle ...but can Mama Monkey catch up with the mysterious flying fruit? And why is she so attached to it anyway? The fantastic pairing of Tony Bradman and Katharine McEwan have combined to produce a brightly coloured jungle romp based on the age-old hot potato theme and a case of mistaken identity. 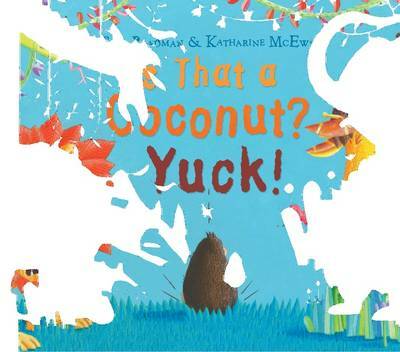 An ideal read-aloud book, Is That a Coconut? Yuck! combines rhythm, repetition and a gentle night-time ending to make it the perfect bedtime story.